Visiting Time: The Ellora caves are open throughout the year even on national holidays. In the week, they are closed on Tuesdays. On other days, they are open between 0600 – 1800 hours. Visiting Duration: Ellora caves are one of the largest cave networks. To completely enjoy them it takes about 2-3 hours usually. The visitors are advised to plan their day accordingly to completely utilize their time of stay. Ellora caves are the proof of the abilities of our ancestors and their hard work. Located in one of the most scenic places of North India, Ellora caves serves as a reminder of Indian history and cultural harmony. It is a marvelous sight to watch and will definitely leave you astonished! Summers can be really hot. It is better to carry shades and hats to protect yourself against the heat. Wear comfortable shoes. You will have to walk around a lot while exploring the caves. Do not stray away from your guide. Always be aware of your surroundings. Stay alert. Photography with flash is not allowed. The flash light damages the ancient paintings. This is a very important historic site and protected by the Government of India. Littering in the caves and defacing any part of the cave is punishable by law. Either have a heavy brunch or carry some snacks along with you. There is not much choice for a place to eat near the caves. Check out the beautiful carving and wall paintings by some of the best artisans of that time. Observe the ingenious architectural work by the ancient craftsmen. 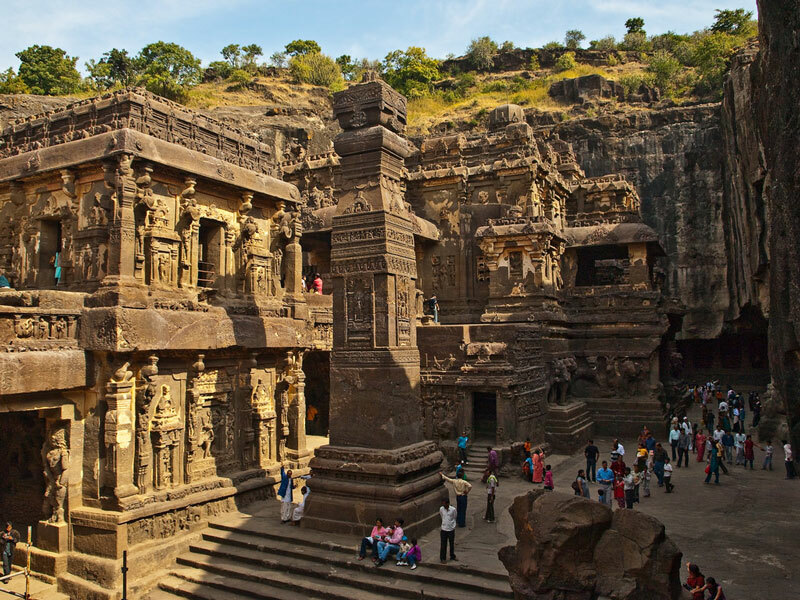 Visit the Kailash Temple, the world’s biggest monolithic sculpture. Click some brilliant photographs of the nearby areas of Ellora caves. Spend some time in the monasteries, prayer halls and the temples in the caves. Guides can be easily booked to take you for the tour of the Ellora caves. They can either be booked from the local tourist agency or through online tourism portals. The guides will be able to answer most of your questions but if you want in depth knowledge about everything then it’s better to carry a tourist book. The weather is quite pleasant the whole year. But the summers can get really hot and uncomfortable to travel in. So, the best time to visit these caves would be between July – March. This should allow you to fully enjoy your stay without much discomfort. Aurangabad is a major city and well connected to nearby major cities like Mumbai, Delhi and Bangalore by flight and train. Once you are in Aurangabad, you can move around inn public buses, autos or taxis. You can very easily book a cab from various private operators. These monumental caves have been roughly tagged to AD 575 to early 9th century for their origin dates. It’s hard to exactly pick a date because of the overlapping cultures that are represented in these caves. Unlike Ajanta which is solely dedicated for Buddhism, Ellora has caves representing Buddhism, Hinduism and Jainism. This shows the religious harmony that was prevalent in those times. Each of these cultures has been wonderfully represented through murals, frescos and sculptures. Everything that is in these caves represents the artistic vision and the dutiful hard work of the excellent artisans who made all of this possible. 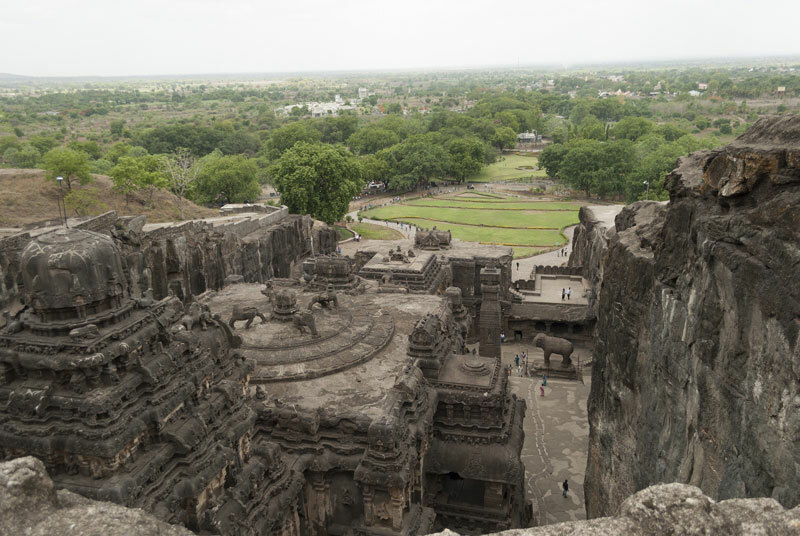 Ellora is a cave structure with over a 100 caves, but only 38 of them are open and safe for the public. It is also a UNESCO World Heritage site. The center piece of these caves is cave 16. It is more of a temple than a cave dedicated to Lord Shiva. The special characteristic of this temple is that it is the world’s largest monolith. It is all carved out of a single block of stone. Ellora caves are an epitome of Indian art and the expert abilities of the artisans of that time. They symbolize the mutual respect and the communal harmony that holds this great nation together. This is a place that you should definitely have a look at.